What is JIPMER & Why JIPMER? JIPMER is an autonomous institute and it offers MBBS in Undergraduate level. JIPMER Notification released for the academic year 2019(JIPMER dosn't come under NEET, if the candidate wants to join in JIPMER he/she should write and qualify in JIPMER Entrance Exam). He/She has completed age of 17 years at the time of admission or will complete the age on or before 31st December 2019. i.e. they should have been born on or before 01-01-2003. The Higher/Senior Secondary Examination or Intermediate or The Indian School Certificate Examination which is equivalent to 10+2 Higher/Senior Secondary Examination after a period of 12 years study with Physics, Chemistry, Biology / Bio-technology subjects are eligible to apply JIPMER-2019. OBC Certificate must be produced during counseling should NOT be older than ONE Year on date of first counseling. (Between 25.06.2018 and 26.06.2019). Applicants who are not covered under the scheme of reservation for SCs, STs and OBCs and whose family has gross annual income below Rs. 8.00 lakh (Rupees eight lakh only) are to be identified as EWSs for benefit of reservation. Signature Uploaded by the candidate is in Black Color. Photograph MUST be taken on or after 31.01.2019. 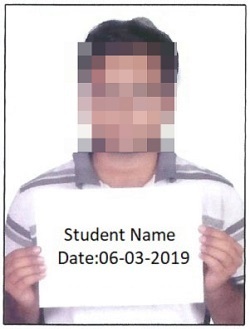 The photograph must be taken with a placard while the placard is being held by the candidate indicating name of candidate and date of taking photograph. JIPMER will provide the facility of downloading Admit Cards on the JIPMER website from 20.05.2019 to 02.06.2019.